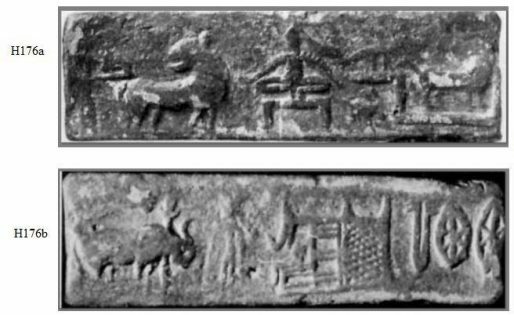 The popular story of ‘The hunter in the tree, the tiger and Shiva’ (associated with MahaShivaratri) is related to a similar recurring theme found on a number of Indus Valley seals and seal tablets. Please see the collage above before reading the story. The Shiva Purana and Shanti Parva tell the story of Lord Shiva and the hunter Lubdhaka. Before I tell that story it should be realized that the hero of that story, Lubdhaka, was our original Skanda. Similar stories about Skanda were told in other parts of India where the hero also acquired different names like Murugan or Kartikeya, but over time I found out that it was all about Skanda. On the seals his name is usually spelled Kanta. Lubdhaka, a hunter was roaming in the jungle on the banks of the Kolidum River. Suddenly he heard the growl of a tiger while he was chasing a deer. To put himself in safety from the tiger, he ran as fast as he could to the closest-by tree and climbed in it. The tiger just waited at the foot of the tree, not intending to leave. All through the night, the hunter had no choice but to stay in the tree. But to keep himself from falling asleep (afraid that he would fall if he didn’t) he nervously kept plucking the leaves of the tree’s branches one by one and dropped them to the ground below, chanting all the while. 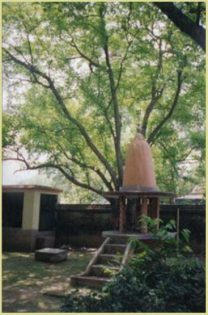 He did not know it, but at the foot of the tree (a Bilva or Bael tree) was a Shiva Lingam. Without realizing it Lubdhaka was dropping Shiva’s favorite Bilva leaves on the Lingam. By sunrise, when the hunter looked down to see if the tiger had gone, he didn’t see the tiger, but instead in its place was Lord Shiva. The hunter quickly climbed down and immediately prostrated himself before the lord, and while Shiva blessed him, Lubdhaka became liberated from samsara, attaining moksha. Looking at the four seals beneath the painting, we see the figure in the tree – the fearful hunter – and we see how the tiger is patiently waiting. The tree on the seals is the Bilva or Bael tree. What is missing on the seals is the Shiva Lingam that figures in the story. 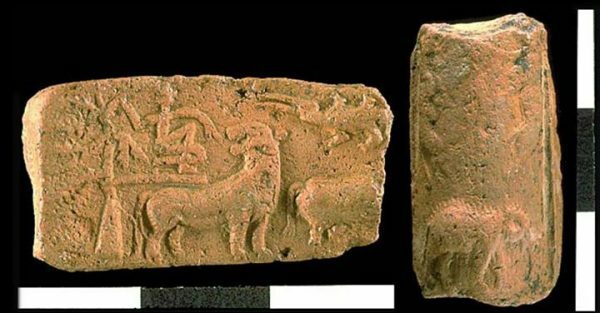 But quite likely the devotion to Shiva in that specific Lingam format had not developed to that extent yet when these seals were produced in the Indus Valley. Throughout India in the country-side one finds Lingam stones along the wayside. The Lingam picture in the collage was taken on Elephanta Island, it was under a Bael tree. The brown colored seal also shows a crocodile and possibly a water buffalo, indicating that this was in the proximity of water, a river, in the story named the Kolidum river. I placed another seal next to the painting, suggesting that the figure who is in a pose of devotion to Shiva, is the hunter from the story. As certain details in the more recently composed Shiva Purana and Shanti Parva versions are not on the seals, the seals must be predating the Purana versions. Some time ago, after I drew the above conclusions, my next step was to find out if the inscriptions on the seals were indeed about Shiva. 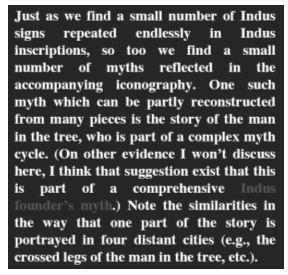 As I found no corroboration in other decipherment attempts I decided to use Sue Sullivan’s (See chapter two) decipherment in her ‘Indus Script Dictionary’ to read and interpret the various inscriptions on the seals shown. 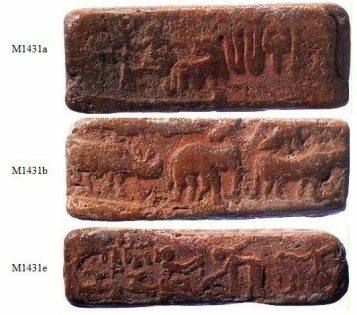 If the inscriptions were indeed about Shiva, the conclusion I drew about the relationship of these seals to an early origin of the hunter story would be supported; as well, it would lend support to Sue Sullivan’s decipherment to be on the right track. 1. 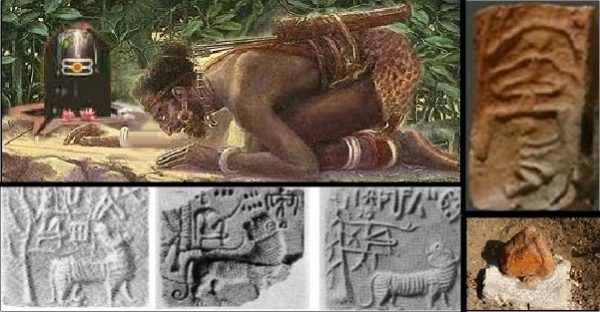 As far as I know a connection between the ‘hunter/tiger/tree/Shiva/lingam/moksha’ story and various IVC seals showing ‘a figure in a tree, with a tiger beside it looking back’ has not been made before. If the story refers to Shiva (and it does) and if the seals and the story are connected, then the seals must therefore also refer to someone who was either Shiva or who later was equated with Shiva. The Sullivan code translations looked very promising at that point in my search. 2. While I was looking for Shiva/tiger pictures in Google images, I found that modern painting of the hunter with a tiger skirt and the lingam. I found it very beautiful and it somehow inspired me deeply. It was some hours later that I read the legend that came with that painting. When I read it though, it struck me that there was no tiger in that legend, but it was a tiger that reminded me of a story that I heard in 1954 on Dutch TV by the Indonesian storyteller Indra Kamadjojo. I was about ten years old at the time in Holland. That memory helped me to draw a definite link between various Indus Valley tablet seals and the ancient Hindu legends. 3. 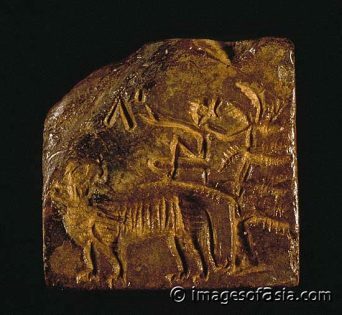 I selected a few of the seal photographs that I had already collected and posted them on the Harappa.com Facebook site together with the above picture and story and announced the logical connection. 4. I also found that there are a number of seals showing a figure in devotion in front of or underneath a meditating figure and suspected that they might very well be related to the Shiva/lingam story, although if so, they must predate the story as no lingam was showing on those seals, instead it shows the sitting figure who I thought might well be Shiva. What must have happened over time (thousands of years), in the telling and retelling of the story, Shiva must have become symbolized by the lingam. 5. The way I interpreted the kneeling figure, he was either in a devotional pose or a pose of gratitude as he had been granted moksha. 6. Throughout the country-side in India one finds lingam stones underneath a tree by the wayside… (The first one I saw was on Elephanta Island near Mumbai, under a… Bael tree .) If the lingam stones have no marigolds, which they often do, then at least they are painted reddish orange. 7. The Bael tree was very important in the IVC agriculture and industry. In my story “the Valley” I refer to those trees (although not by name as I then was still looking for more evidence). There is mention in many ancient hymns of a hard citrus fruit or a stone apple. Featured image courtesy: netglimse.com and Google.